While Comic-Con attendees are currently experiencing the next-gen console wars with their very own thumbs, Microsoft used its PAX Australia panel to confirm that Aussies will get their first taste of the Xbox One at the EB Games Expo on October. Around 100 of Microsoft's next console will be on the show floor for gamers attending the retailer's Sydney event in October. 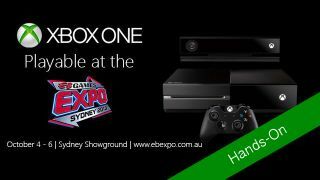 "We are thrilled that EB Games and Microsoft are combining forces to give gamers a chance to get hands-on with the Xbox One at this year's EB Expo. We hope that this glimpse of the future is as exciting to the gaming public as it is to us." In stark contrast to the abundance of hardware at the Sydney Expo, Microsoft has taken a much more subtle approach to the console's presence at PAX. A small Microsoft stall in the main expo hall held nothing more than an empty glass box for most of the opening day, with a sign explaining the console's presence for two hours a day. Exactly why Microsoft has been so frugal with the console is unknown, although that can be said about many of Microsoft's Xbox One decisions so far.